Apple's UK release of the iPad could be delayed by a month because the company is struggling to keep up with higher than predicted demand in the US. The iPad was initially scheduled to go on sale in the UK and elsewhere before the end of April, but Apple has announced it will not start taking pre-orders until 10 May for deliveries by the end of May. Apple claims to have sold 500,000 iPads in the US in the first week after the device's 3 April launch, which has exceeded forecasts of initial sales of between 100,000 and 400,000 according to reports. The delay has led to speculation by analysts as to why Apple cannot meet demand, including difficulties in scaling new manufacturing processes, a lack of new components, and supply delays due to the series of earthquakes that have hit China. The iPad is not the first Apple device to be hit by delays, with the iPhone 3G and 3GS suffering similar shortages shortly after release. The announcement of the iPad delay came as UK-based telecoms operator Vodafone said it would be offering mobile data price plans for the 3G version of the iPad in Australia, Germany, Italy, Spain and the UK from the end of May, according to the Financial Times. France Telecom's Orange will offer services in France, the UK, Spain and Switzerland, while Telefónica's O2 will also carry the iPad in the UK. 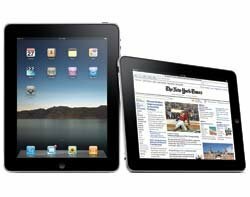 Only a Wi-Fi version of the iPad has been released so far, with a 3G version that will require a special micro-SIM card expected to be released in the US at the end of April.